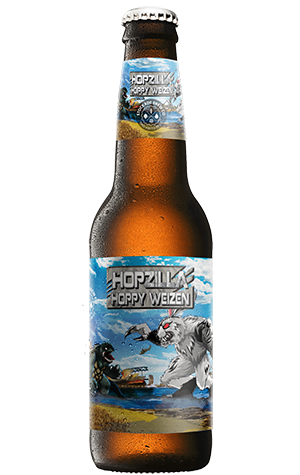 The striking comic artwork on Hopzilla features an angry hop cone chested Godzilla-type creature in a rather large disagreement with a giant rabbit that appears to have escaped from a lab experiment gone badly wrong. These two beasts at odds with each other but bound together is a fitting visual descriptor for the two contrasting styles this beer is built on: a hefeweizen laced with the hoppy elements of an IPA. Based on those starting points, this is a beer likely to polarise drinkers. There will be those who will say yes to a hefe and yes to an IPA, but not in the same glass. Then there are those who say, “Whatever. Bring it on!”. Quite obviously this beer is for the latter and what they (or you) will be enjoying is the classic wheat beer esters of banana and clove and that typical cloudiness. Alongside that there’s a serious wallop of New World hops; US Cascade and Citra and Aussie Galaxy. That means a beer that’s got more bitterness than the rest of Stockade’s core range, with the exception of the straight IPA. For it’s style – or rather, blend of – Hopzilla does strike the balance it seems to seek while still playing up the fact that it’s a monstrous brew.